American manned Mars flyby. Study 1966. Final NASA attempt to mount a manned Mars flyby mission by 1975 using Apollo hardware. It took the best elements of the NASA Huntsville and Douglas concepts of 1965, requiring only four Saturn V launches. Status: Study 1966. Gross mass: 400,000 kg (880,000 lb). A request for proposal to vendors had already been issued when Congress killed all further NASA Mars work in August 1967. Under the Apollo Applications Program, in 1963 to 1975, Apollo hardware would be tested on long duration earth orbit missions and the effects of weightlessness on human beings for up to one year would be studied. Mariner robot probes would conduct a flyby of the planet in 1969, followed by an atmospheric probe in 1971, and finally the landing of a Voyager robot in 1973 that would be equipped with life-detection equipment. Piloted Mars/Venus flybys would be conducted, with launch dates of September 1975, October 1977, and/or November 1979. A combined Mars/Venus mission could be conducted in December 1978, and a mission with two Venus and one Mars flybys in February 1977. On all of these missions probes based on Mariner and Voyager would be used. The mission profile involved a single Saturn V launch with an Apollo Command Service Module, the flyby spacecraft, and an MS-IVB stage. The MS-IVB was a modification of the basic S-IVB, with stretched tanks and more internal foam insulation, allowing the stage to remain for sixty hours in low earth orbit before firing. The CSM, with four crew, would undock from the stack, transpose, and dock with the flyby spacecraft. The flyby spacecraft itself consisted, from fore to aft, of a Mid-Course Propulsion Module with four engines; an Earth Entry Module (a modified Apollo CM, which would also serve as a radiation shelter); and a two-level Mission Module, 4.27 m in diameter, providing living quarters on level 1, and a control console and wardroom on level 2. Exterior to the MM would be a manipulator arm; a biology lab; a 1-m diameter telescope; an airlock for spacewalks equipped with a the CSM docking unit; and a 5.8 m diameter antenna. 185 square meters of solar panels would produce 22 kW at earth and 8.5 kW at Mars and 4.5 kW in the asteroid belt. The mission scenario involved four Saturn V launches. Launch 1 would orbit the crew and the spacecraft, and launches 2 to 4 would place three MS-IVB's into earth orbit. In order to make this many launches in the short 60 hour storage life of the MS-IVB's, a third Saturn V launch pad, LC-39C, would have to built at the Kennedy Space Center. The Apollo CSM would power the spacecraft to a series of rendezvous and docking maneuvers. After all three MS-IVB stages had been docked in tandem, the Apollo CSM would undock and redock with the side airlock port. Following checkout and testing, the temporary forward docking structure and the Apollo CSM would be jettisoned. The three stages would be fired in sequence to send the spacecraft toward Mars. This would all have to occur in a launch window extending from 5 September to October 1975. The coast to Mars would take 130 days, with flyby occurring between 23 January and 4 February 1976. Three 45 kg impact probes, a 4500 kg orbiter, a 567 kg lander, and a 5450 kg Mars Surface Sample Returner would be released toward Mars. The MSSR would return a 1 kg sample to the spacecraft, where it would be studied during the coast back to earth. 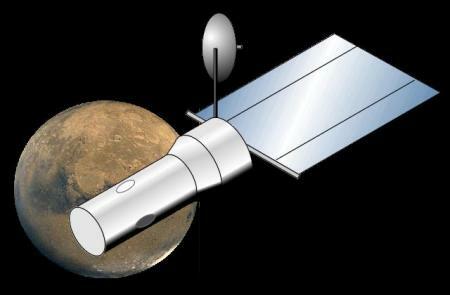 The MSSR would be an unmanned versions of the FLEM Mars flyby lander. MSSR would be released weeks before the flyby, land, but then rocket off the Martian surface with the sample 5 minutes after closest approach of the flyby spacecraft. 17 minutes later it would be in solar orbit, a few kilometers ahead of the flyby spacecraft. The flyby would rendezvous with it and snare it with a boom-mounted docking ring, which would then move it to the lateral docking port. The return coast would take the crew out into the asteroid belt, allowing studies to be made there, before returning to earth on 18 July 1977. However further Apollo Applications and Voyager budget cutbacks caused work to be suspended on flyby planning. Only in January 1967 did JAG resume flyby planning for the FY 1967 budget discussions. The plan was presented to Congress on 26 January 1967. The Apollo fire the next day caused most Congressman to lose all interest in supporting risky manned spaceflight adventures. In February 1967 the report to the President's Science Advisory Committee called for Apollo Applications missions in earth orbit, lunar Apollo follow-on missions, but only the robot Voyager probe for Mars and no manned flyby missions. JAG tried to keep the mission alive by cutting the spacecraft back so that only two MS-IVB launches would be required, meaning no new construction of an LC-39C pad would be required. But in August 1967 Congress eliminated all funds from the NASA budget, not only for manned Mars missions, but for Voyager as well. Requests for Proposal had already been issued for the MSSR and manned flyby spacecraft. These were withdrawn. This essentially ended NASA efforts to mount manned missions to Mars in the 1970's as a post-Apollo activity. Family: Mars flyby. Country: USA. Agency: NASA Huntsville. Bibliography: 591.